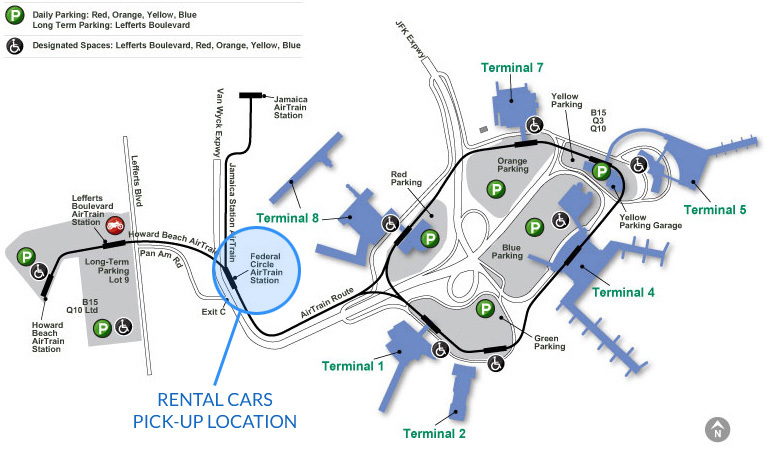 Finding your rental is easy at JFK. On the Arrivals level of each terminal (usually near the baggage carousel), there is either a rental car counter or courtesy telephone with instructions on contacting each of the companies listed below. As for the cars themselves, simply take AirTrain to the Federal Circle Station. Check with your rental car agency to learn about their company policy for paying tolls. Some rental car companies provide E-ZPass® transponder tags. In those cases, be sure you understand how to use the transponders and learn about any fees or charges. Fees vary among rental car companies regarding unpaid tolls, so it is important to find out the specifics in advance. If you have an E-ZPass® account, and decide to use your own transponder, we do NOT recommend adding the rental car license plate number to your account.